There are many ways of popping popcorn. Although many people nowadays use the microwave for making popcorn, a lot of people still prefer the taste of traditional stovetop popcorn. Popcorn made this way has only sixty calories per cup. Air popped popcorn only has thirty calories for each cup but most folks agree that it just doesn't taste quite as good as traditional stovetop popcorn. The stovetop method of popping popcorn has been around for a very long time. Pioneers made traditional stovetop popcorn in this fashion, even back when the stoves used coal or wood for cooking and lard was the oil of choice. Fortunately, in this day and age we have gas and electric stoves and several oils better suited for popping and our health. The following is our recommendation for the best way to make popcorn using the traditional stovetop method. For additional useful information on this method continue reading after the recommendation. Measure out the amount of popcorn kernels you plan to make - A typical amount is 1/2 cup of kernels which will make about 4 quarts of popped popcorn. Be sure that you don't put in too many kernels so that they can't be spread out on a single layer on the bottom of your pan. Put the kernels aside for the moment. Add 1-3 tablespoons of oil to the pan - The exact amount depends on how oily you like your popcorn and the size of your pan. At a minimum there needs to be enough oil to coat the kernels when they're added to the pan. Put the pan on the burner set to Medium High - Since every stove is different you may want to experiment with a variety of heat settings to find the one that works best with your stove and pan. Drop three kernels into the pan - Swish them around to get them coated with oil and put on the lid. Once these kernels pop you can move on to the next step. This assures the oil has been heated to a temperature suitable for efficient popping. Open the lid and add all of the kernels you measured earlier - Swish them around to get them coated with oil. Also be sure all the kernels are on a single layer on the bottom of your pan. Replace the lid so that it is possible for the steam to escape once the popping begins. Shake the pan occasionally once it starts popping - Don't get carried away with this - you don't need to being shaking it vigorously throughout the entire popping cycle. Just a couple of shakes once in a while should do it. Remember to keep the lid ajar so the popcorn stays light and fluffy. 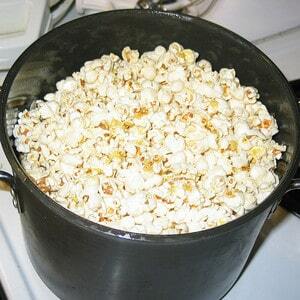 Remove the pan from the heat - Do this once the popping slows down significantly and dump the popcorn into a serving bowl right away. Be careful when you remove the lid that the steam doesn't hit you in the face. Add salt or other seasonings then dig in! What's Required for Traditional Stovetop Popcorn? Popping corn on the stovetop is quick and easy to do. All you need is a pan, some oil, and popping corn. Obviously, you want to select a pan which is large enough to hold the popcorn once it has popped. Most popcorn poppers designed for the home make about 6 quarts. Ideally a smaller diameter pan works best since it takes less oil to cover the kernels. A 6-10 quart stockpot works great. Some people recommend using a grease screen when making traditional stovetop popcorn to cover the pan so that the steam can escape easily keeping the popcorn dry and fluffy. Personally, I don't like the screen since when kernels pop they blow off a small vapor of oil, some of which passes through the screen and makes a mess on the stovetop surrounding the pan. I prefer using a glass lid so I can see the corn popping. But after a little of the popcorn has popped, I angle the lid to let the steam out. There are a variety of oils that can be used for making popcorn including oils specifically designed for popping popcorn. Folks use olive, peanut, canola and corn oils all with great success. It really comes down to a personal preference. Perhaps the popcorn kernels are the most important single factor in making great traditional stovetop popcorn. The variety of kernels on the market today is mind boggling. We will be addressing this chief ingredient throughout this website. Popcorn fans have developed numerous techniques for making stovetop popcorn. Each one is convinced theirs yields the best popcorn. However, there are four key factors that they all have in common. When making traditional stovetop popcorn, typically 2-3 tablespoons of oil are used. This should be enough to coat the kernels when they are on a single layer at the bottom of the pan. It's important once the popcorn begins to pop that you occasionally shake the pan. Some people recommend shaking the pan vigorously and continuously the entire time the corn is popping. My experience would indicate this is a major overkill. I give it a quick shake 2 or 3 times during the popping cycle and I have never had a burnt kernel. But if you just let it sit there the whole time you better get out the air freshener because you're going to need it! As the popcorn is popping make sure you allow the steam to exit the pan. If you forget this critical step the popcorn will be moist and chewy rather than dry and fluffy. Finally, once the popping slows down appreciably you need to take the pan off the stove and immediately dump the popcorn into the serving bowl. This prevents burning and keeps the popcorn dry and fluffy. From the many techniques used to make traditional stovetop popcorn we have decided to present three of the more popular ones - you can try them and see which one you prefer. Place oil and popcorn kernels into the bottom of a cold pan. Then swish the pan around to coat the kernels with oil and arrange the kernels on a single layer. Turn the burner up to a medium-high heat. Do not place the pan onto the stove until the burner is very hot. Once the burner is hot, you should place the pan over the heat. When the corn begins to pop, shake the pan regularly. Be sure to allow the steam to escape so the popped corn stays dry and fluffy. When the kernels have all popped, remove the pan immediately from the stove and pour the traditional stovetop popcorn into a bowl. Place the oil into the pan and add 3 kernels. Put the pan onto the burner and turn it onto a medium-high heat. Leave the pan on the stovetop with the lid on until the kernels pop. Once the three kernels have popped, indicating that the oil is hot, add the rest of the popping corn. Then swish the pan around so all the kernels are coated with oil and there's only one layer of kernels on the bottom of the pan. It is essential that you shake the pan regularly once the corn begins to pop. Be sure to allow the steam to escape so the popped corn stays dry and fluffy. When the kernels have all popped, remove the pan immediately from the stove and pour the popcorn into a bowl. Place oil into the pan and add 3 kernels. Put the pan on a burner that has been turned onto a medium-high heat. Once the few kernels have popped, indicating that the oil is hot, add the rest of the popping corn. Then swish the pan around so all the kernels are coated with oil and there's only one layer of kernels on the bottom of the pan. Take the pan off of the heat for thirty seconds to rest and then replace it on the burner. Once the corn begins to pop, shake the pan regularly. Be sure to allow the steam to escape so the popped corn stays dry and fluffy. After they have all popped, remove the pan from the heat and turn the burner off. Put the traditional stovetop popcorn into a bowl and enjoy your snack. Making traditional stovetop popcorn is easy to make using a pan you already have, so it doesn't require the purchase of a specialty device. The popcorn is always good but it does have a light coating of the oil you used during popping. Most people think this is a good thing since they like the flavor the oil adds. However, the oil makes it slightly less healthy than popcorn made without oil. Also, if you plan to add flavoring after the popcorn has popped, you may prefer to not have the flavor of the oil already on the popcorn. In these cases a method of popping the popcorn without oil is a better approach. You can refer to the articles on air and microwave popping.